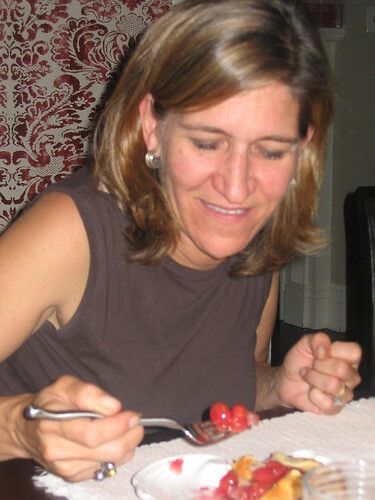 Pie Day Friday: Can She Bake a Cherry Pie? In case you haven’t flipped the page on your calendar yet, I’d like to remind you that the 4th of July – and all its accompanying patriotic frivolity – is fast approaching. This Tuesday, many Americans will spend the day getting pink-skinned at the beach or pool, and later, will join family and friends for incendiaries, inebriates and Independence Day feasting. Sometimes the feast will involve a potluck, and sometimes that means you will have to offer up dessert. What in the world will you bring? Gee, I have an idea. And what could be more American? While some may consider apple to be the quintessential American pie, there’s one reason I can’t recommend that you put an apple pie in your 4th of July picnic basket: Apples are not in season. Luckily for you, cherries are. 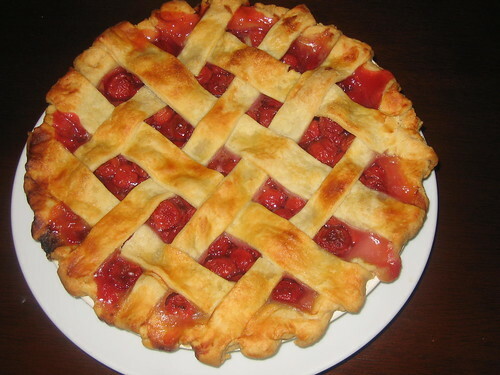 Now before you rush to the store and pick up a quart-basket of those tasty, burgundy-skinned or creamy pink-mottled variety, heed this warning: Don’t bother making this pie unless you have tart, ruby-red pie cherries. While those other varieties are just fine for piling in a bowl and grabbing handfuls to munch on and spit their seeds across the patio, only their flashy first cousins will do for this pie. When you do find a source for pie cherries, I advise you to buy a lot of them. Use some for this pie and then freeze the rest. You’ll need to pit them, of course, but I promise you that’s not as grim a prospect as you might imagine. 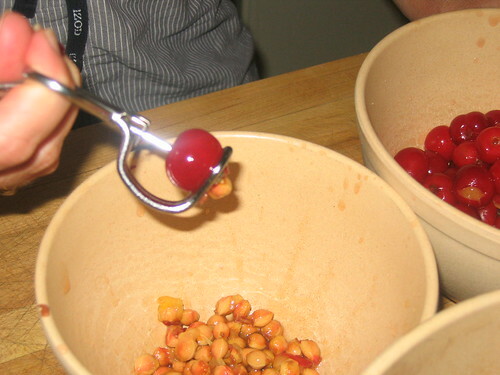 Position yourself on the sofa with three bowls: one containing the pre-pitted cherries and one each for the pits and the resulting pitted cherries. Pour yourself a beer and turn on a baseball game – preferably one involving the Reds, Cardinals, Dodgers, Yankees, or Red Sox (okay, I admit it – I’m polyamorous when it comes to The Boys of Summer)-- or a good movie (In America, or Kinsey if your children aren’t hovering nearby). And then you pit. And pit. And pit. Use whatever implement you have – the tip of a spoon, a clean hairpin, or an actual cherry-pitter – and be prepared for your fingertips to get stained and sticky pink juice to spill into your lap. You won’t care because you’ll be cheering the Reds crush the Cubs. 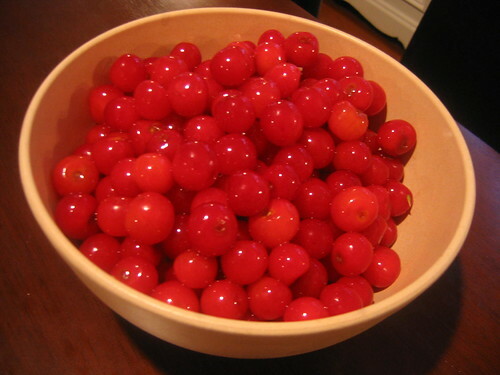 By the fourth inning, you’ll have gone through several pounds of cherries and will be ready for another beer. Reserve about a pound and a half of the pitted cherries for the pie and package up the rest into Ziploc bags for freezing. Come January you can make another pie and send me a thank you note. 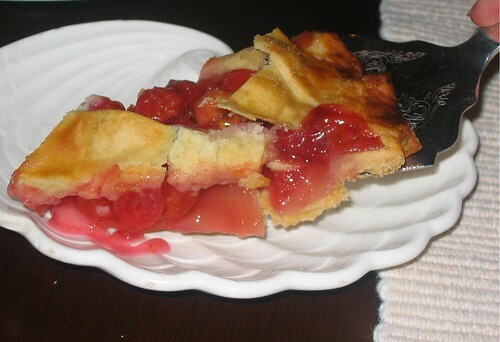 Not only is this a perfectly luscious pie specimen --the tartness of the cherries melding with the sugared cherry juice and buttery crust -- but it’s an absolute beauty. The cherries don’t lose much of their stunning color during baking – although they get a tiny bit shriveled – and they peep up through the lattice of the crust in a most tantalizing way. To make crust, combine flour, salt, and sugar in food processor. Add butter and process by pulsing until mixture resembles meal. Slowly add water and process until mixture holds together. Press dough into 2 balls and then flatten slightly. Wrap in plastic wrap and chill at least 1 hour. For filling, stir together sugar, cornstarch, and salt in large bowl. Add cherries and their juices, along with almond extract. 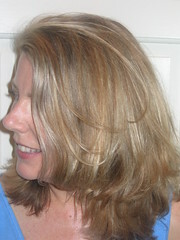 Let mixture sit at least 15 minutes – or up to 3 hours. When ready to bake, preheat oven to 425. Remove pie dough from refrigerator about 15 minutes before rolling out. Roll out first piece and place in pie plate, trimming edges of dough to extend about ¾ inch past rim of plate. Stir cherry filling well and pile into pie plate. To make a woven lattice, roll out second piece and cut into 8 long strips, about ¾ - 1 inch wide. 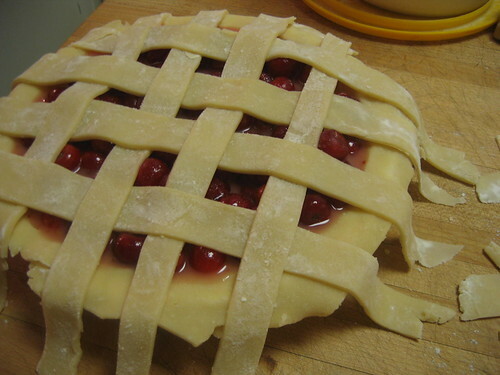 Lay four of the strips evenly over the cherries, parallel to one another. Fold back onto itself every other strip (2 strips will be folded back). Then, starting at center, lay new strip at right angle over the 2 strips that aren’t folded back. Unfold the first strips and fold back the other 2. Lay another new strip down. Repeat on other side, starting again from center. When all the strips have been put down, trim them to edge of pan and then, fold over dough from pie plate and crimp edges. Serve generous slices topped with vanilla ice cream to good friends who are deserving. How??? I've never seen a pie last several hours after coming out of the oven. I find it hard to believe that QoT does not have one of those little cutting wheels that makes the edges of her strips of lattice have little crinkles like it was cut with a pinking shears. Y'know this is exactly the sort of thing I was referring to when I was asking about "tools" that a piemaker must have. Perhaps the KoT could get you one on the next occasion that calls for a gift (July 4th, perhaps). Where did you purchase the cherry pitter?...My husband is currently in Iraq, and I would love to bake him a cherry pie to welcome him home...I just love your pie's! Anonymous, A confession: The palace kitchen is a most ramshackle space (and quite unfit for a Queen). However, the non-functioning microwave oven makes a terrific pie safe. Currydude, Splendid idea! I'm sure the King is anxious to explore new opportunities for emptying the kingdom's coffers and will thank you for the fine suggestion. Laura, You should be able to find a cherry pitter at any decent kitchen supply store. If not though, send me a note at madametart@gmail.com and I'll send you one. Best wishes for your husband's safe travel.